DeAndre Jordan’s having second thoughts about where he wants to sign, so now the Mavericks and Clippers are standing at either side of him, clapping and telling him to walk to them. 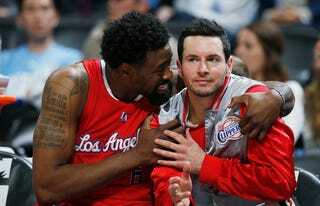 Dallas thought it had an agreement with Jordan, but now the Clippers are making a desperate second effort. The Mavericks’ Chandler Parsons doesn’t look like he’s giving up, though. Wait, what’s that rumbling in the distance? Update (2:41 p.m.): Chris Paul’s banana boat is going as fast as it can! Update (3:14 p.m.): Dammit, Paul. Do you not have emoji? Update (4:26 p.m.): Get out of here, Austin. Basically, imagine It’s a Mad, Mad, Mad, Mad World, recreated with various members of the Clippers and Mavericks. Steve Ballmer’s in a jetpack.